Ever wonder what the universe is made of? 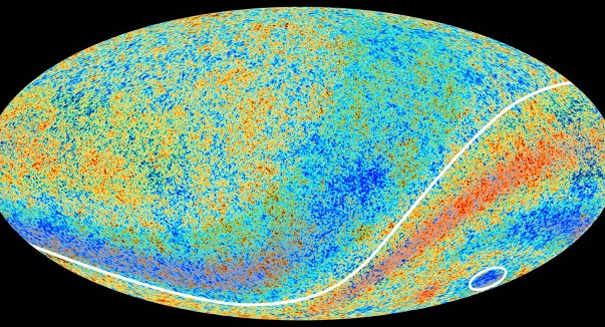 A recent study describes a mysterious 'Cosmic web' holding all matter together. The matter that we can see, touch, and are even made of, composes roughly 5 percent of the mass of the entire universe. Roughly half of this percentage has yet to be detected, and researchers are still searching for an explanation about the other 95 percent. According to a report from Phys.org, a new discovery from researchers at the University of Geneva in Switzerland has just offered key insight into where the rest of the ordinary matter exists. The study, published in the journal Nature, shows that the vast majority of this “missing matter” exists in the form of extremely hot gas that form a ‘cosmic web’ extending throughout the universe. The gases in this web can reach temperatures ranging from 100,000 to 10 million degrees. Galaxies are created when normal matter collapses in on itself and begins to cool. Scientists discovered that there was a form of matter that we had not detected up until this point – the ‘missing baryons’ of the universe. Astrophysicists from the UNIGE and the École Polytechnique Fédérale de Lausanne examined a massive galaxy cluster called Abell 2744, a complex network of dark and visible matter at the center. The cluster was spotted through the XMM space telescope, which uses x-rays to detect hot gas signatures in deep space. Studies of these large galaxy clusters have revealed that normal matter is hardly evenly distributed throughout the universe. Gravity concentrates this matter into filament-like structures, which together weave what scientists call the ‘cosmic web.’ Heavy gravity causes certain regions to collapse and create knots, like the ones seen in Abell 2744. Hot gas connects these knots, and it is here that the researchers were able to account for the missing baryons. Astronomers were able to measure 10-million degree gas structures for the first time using the XMM, and their findings have revealed the location and state of this previously unaccounted-for matter. A press release from the École Polytechnique Fédérale de Lausanne outlining the details of the study can be found here.